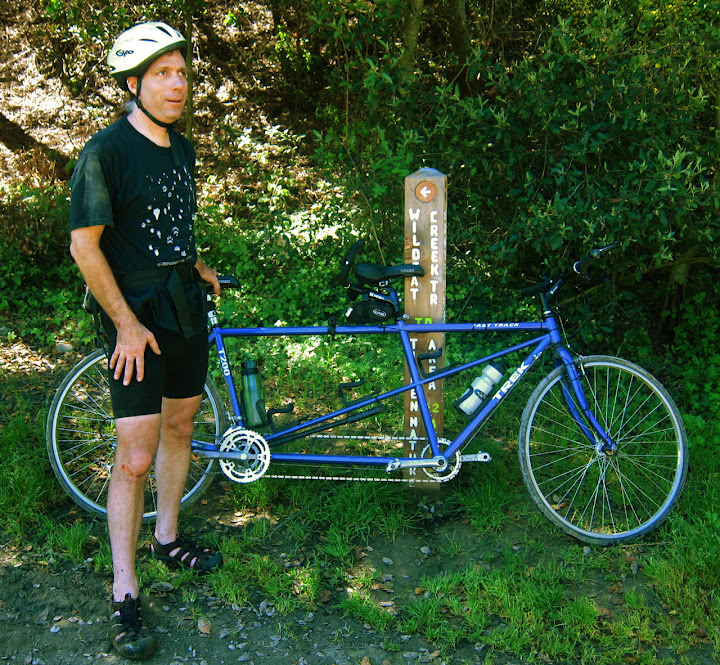 The bike in question had been recently donated to BORP’s Adaptive Cycling Center at Berkeley’s Aquatic Park. The shiny blue Trek had flat bars and 26 inch wheels, like you would find on a typical mountain bike. On the other hand, it lacked suspension and sported a set of slick, narrow tires only marginally wider than those on the Cannondale road tandem my buddy Marc and I rode to BORP. Marc is blind and I am not. In the over two years that we have ridden together, I’ve tended to put out the crazy ideas like — Hey Marc, you want to go mountain biking this weekend? — and Marc has never been anything less than enthusiastic. In fact, when I lamed out of one of his invitations — Hey Ginger, you want to bike to this crazy party in Truckee? — he went ahead and rode back from the Sierras with a guy who only had one good leg. He and I were pretty set on riding dirt. Surveying the Bike House, we considered our options. Though none of the tandems had knobby tire per se, the orangeade colored Co-Motion tandem had 1.75″ tires with a little bit more tread. Still, a bike with drop bars didn’t quite look the part for dirt riding. Every bike was the wrong bike for the job. In my mental calculation, being able to ride up more hills, even if we had to go slower on the descents, trumped the apparent safety of putting more rubber under us. 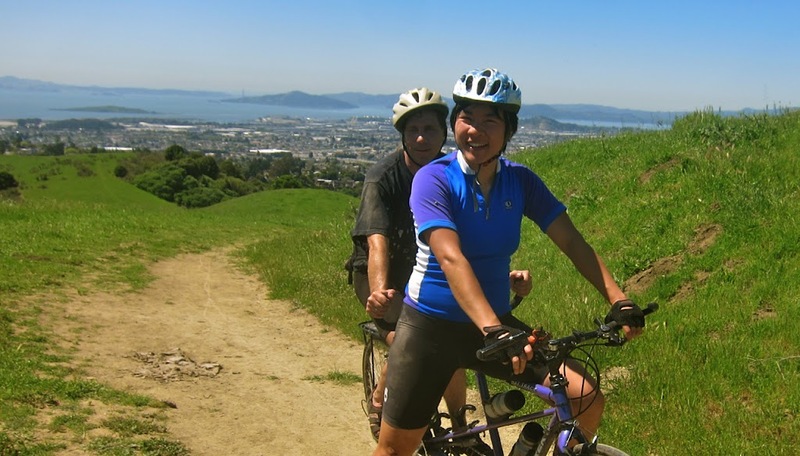 We saddled up the Trek and headed up the Berkeley Hills to Tilden. Wildcat Canyon Trail starts at the packed Little Farm parking lot. I started out cautious, testing the bike’s abilities on the gravelly but level fire road leading through shady eucalyptus groves. Following burbling creek sounds to Jewel Lake, the trail turned into packed dirt and Marc and I started blazing — prematurely. At our first descent, I caught our narrow tires in a rut and threw us both off the bike. We inspected our trail rash, laughed at our brashness, and saddled up again. Reaching the end of Wildcat, Marc and I confronted our options. Ride on gentle grades back the way we came, or turn inland for an overland trek to Inspiration Point? I checked the time. It was only 11:30am, and we didn’t have to return the bike until 3. “Let’s go the steep way,” Marc said. The gravelly cowpath soon turned into narrow single track. As the bike’s pilot and only pair of eyes, my hands knuckled around the bars. Keeping up a strong pedal, I used the momentum to roll over the rutted hoof prints and muddy drainage lines. The bike slipped and I jerked the bars left-right to keep us afloat. “Yea!” Marc yelled and slapped me on the back. Surprised, I gave a whoop as well. In my concentration, I forgot I was driving a tandem. Marc and I looked at each other. “We’re getting the hang of it!” I chirped. In the distance, I eyed the trail winding back towards Berkeley. A pair of mountain bikers on full suspension bikes were rollercoastering up the four or five steep rises between me and Nimitz Way, the paved trail that would lead us home free back in to Tilden Park. As I hosed the mud and blood off the Trek, off Marc, and myself, I thought, Gary Fisher and his buddies invented the sport of mountain biking by rolling fat tired town bikes down fire trails in Marin. Heck, Marc and I passed a woman on a unicycle, going the other way on Wildcat. Who said you need a mountain bike to go dirt riding? « Broken spokes, not brokenhearted.